A properly functioning body does not have asthma or any disease for that matter. Additionally, any body that does have asthma or any disease, the only way to cure it is for the body to self-heal, and cure itself. I believe my body was mal-functioning due to subluxation for 23 years. I am an asthma success case. For 23 years I struggled with asthma, beginning in 1980. I was either five years old at the time. I woke up one morning, gasping for air, took a look at my Pittsburgh Steelers football helmet clock, it read 5:30 am. I woke up mom and said, “Mom, I can’t breathe.” It’s funny, children are so naive. I remember saying it so calmly, yet I couldn’t breathe. Then mom freaked out, woke up my father and we were off to Dr. Casselberry’s. She was a good doctor, did what all good doctors do, save a life in an emergency. She gave me a shot and after what seemed an eternity, I still remember, I calmed down. Breathing returned to normal, and from that point on, I was reliant on drugs. Through the years, I had probably a dozen or so asthma attacks, three happening in my late 20s each requiring trips to the emergency room. I had downed thousands of Slo-Bid capsules, puffed thousands of breaths of Intal, Provental, and later Advair. Thousand of allergy pills (I remember when Claritin was available by prescription only). And thousands of minutes spent on the nebulizer. 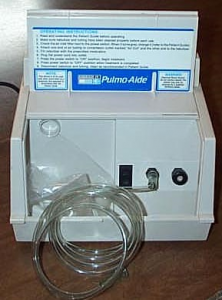 That Pulmo-Aide picture is the exact one I used for years. When I look back on it, what a miserable existence, but I didn’t know any different. My parents only wanted the best for me, they didn’t know there was another way. In 2003, I went to see Dr. Mike Stewart. I had severe sciatica and Dr. Stewart thought my sciatica might be related to a subluxation (nerve interference) at L5. Dr. Stewart had previously practiced as a respiratory therapist and suggested to me that a subluxation at T4 (obviously misaligned on the x-ray) may be related to my asthma. I doubted that because I had asthma for the previous 23 years and no one related my asthma to my spine. The sciatica subsided quickly. Two months later, Dr. Stewart asked how my breathing was. I told him I haven’t been taking my meds as much. I didn’t understand why but that very day I stopped all medications. Never had a problem since. Less than a year after meeting Dr. Stewart, I enrolled in chiropractic college. According to Clinical Medicine, asthma is “a disease characterized by episodic and reversible narrowing of the smaller bronchi and bronchioles through a combination of smooth muscle constriction, inflammation, mucus formation and cellular secretions.” I’m all too familiar with this. Easy to breathe in, difficult to breathe out. Wheezing as the air passes through smaller airways. Muscle spasm is the main characteristic or as stated above, “smooth muscle contraction”. A muscle can only contract with a nerve impulse. The nerves innervate the muscles and the brain sends messages down the spinal cord to the nerves out to the muscles in the airways. If there is interference to those messages from the nerves, the muscles may spasm. Therefore, the disease of asthma lies in the nervous system, not necessarily the lungs themselves. Chemicals also may induce this reaction. During pollen season in Atlanta, my body was hypersensitive to it, pre-chiropractic. If the nervous system senses pollen as a poison, your body reacts irrationally, histamine is released, induces inflammation, and now the air pathways are inflamed as well. In people with allergies, pollen is not a poison, but the nervous system is interpreting it as such. Again the disease of allergies lies in the nervous system, not the lungs or airpathys themselves. Muscle spasm/constriction and inflammation are ALL mediated by the nervous system. Adjusting the spine to reduce nerve pressure can alleviate asthma symptoms, as it did in my case. In my case it happened to be in the middle of my back (T4) as in the diagram. In a 10 year old patient, it was his sacrum that was the problem. Once the pressure was reduced through the chiropractic adjustment, the body can start to function normally, without airway constriction or inflammation. I remember as a kid hearing stories of kids who outgrew their asthma, though it never happened to me. There’s no point in waiting for something that may never happen. During growth if the spine changes, a few hits on the right vertebrae in the proper direction on the football field, maybe even during growth spurts, the spine may realign and pressure may be relieved. I wasn’t this lucky. I spent 23 years suffering and thank God I found a chiropractor competent enough to explain to me how the nervous system works, and that with chiropractic there was hope! I had a great childhood, great friends, great parents. The asthma at times really held me back. It’s the only thing I would’ve changed from my upbringing. If my parents knew about chiropractic, they would’ve tried anything. For any questions, please contact your Chiropractor Carlsbad.